Don’t just tell your customers what you have. Show them with a menu board that reflects your restaurant’s flavor. Menu boards can be custom made to fit any application, and are also available ready-made in certain stock sizes and shapes. 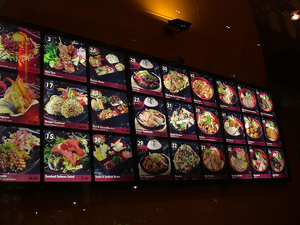 So design your menu board to be as simple or elaborate as you want; whatever your taste, we can create it. Call us today for a free consultation and estimate on your menu board.